Everything you need to ace your test! 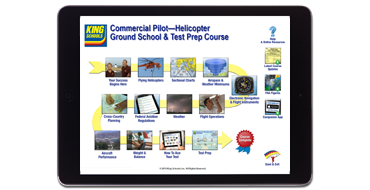 The KING Online Commercial Pilot Helicopter Test Prep and Ground School Course covers everything you need to ace your FAA Commercial Pilot Helicopter Written Exam (Knowledge Test), including all helicopter test areas and all available FAA helicopter questions, answers and detailed explanations. KING thoroughly covers the subject areas in a fun and easy to understand presentation with short, bite-sized interactive video lessons.